The Ad Hoc Committee to Amend Section 25 of the Constitution has agreed to refer their work to the Sixth Parliament. The committee met on Wednesday to finalise its report, and ANC MP Vincent Smith suggested that they include the recommendations that the committee would not be able to complete its work by the end of the Fifth Parliament's term, and that the Sixth Parliament be tasked with amending the Constitution to allow for expropriation of land without compensation. The committee agreed with the recommendation that it could not complete its work before the National Assembly rises on March 20, ahead of the general elections in May. However, DA MP Annelie Lotriet and ACDP MP Steve Swart indicated that their parties reserved their positions regarding the recommendation that the committee's work be referred to the Sixth Parliament. The EFF has pushed that the amendment be completed before the end of this parliamentary term. But, on Wednesday, not a single EFF MP attended the meeting, just like at the committee's previous two meetings. The committee's report will be presented to the National Assembly for deliberation and adoption. This was the committee's final meeting. In its report, the committee also acknowledged the contribution of the "experts" who had made presentations at its previous two meetings. Former Constitutional Court Justice Albie Sachs was one of these experts, and he said that he was a "little alarmed" when he saw the amendment had to be completed before the end of this term, when he addressed the committee on March 1. He did, however, support amending Section 25 and described it as a "great moment" in South Africa's history. At the same meeting, former tourism minister Valli Moosa said that, when the Constitution was drafted, Section 25 wasn't included to protect white people's land ownership. He said it was included after much debate, as one of the most painful things about apartheid was how black people were removed from their land without compensation. He also called on the committee to ensure that South Africans understood what it was busy with. At last week's meeting advocate Tembeka Ngcukaitobi said that there was a need to think creatively about land reform, and to think of it "beyond the mantra of expropriation without compensation". He said, where redistribution had taken place, it had benefitted elites, when it should benefit people who need land. Advocate Wim Trengove also addressed the committee and said it was safe to assume that white ownership of land was the result of privilege, and therefore the burden to prove the historical landownership rested on white people where it was unclear who originally owned the land. 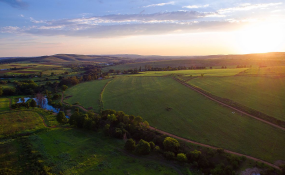 The committee was established last year after Parliament adopted the report of the Constitutional Review Committee, which recommended that Section 25 should be amended to allow expropriation of land without compensation.